Warwickshire County Council is looking at making changes to two schools in Rugby. A consultation is to be carried out at Brownsover Community School and at the nearby Boughton Leigh Infant School in an attempt to tackle a ‘mismatch’ of places. 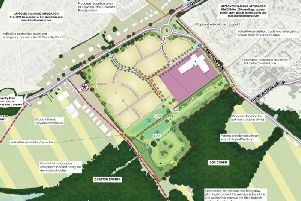 Councillors at this week’s Cabinet meeting agreed to allocate just over £9,000 on the feasibility study with the money coming from developer funds linked to a housing scheme in the north of Rugby. In a council report it was explained that there were too few places for Year 3 pupils when they move up to the local junior school - 120 places available for a potential 150 children. “There is currently a mismatch of infant and junior places in the Boughton Leigh and Brownsover area of north Rugby,” it said. “To date, this shortfall in junior places has been managed through a combination of lower cohorts, capacity in other primary schools in Rugby town and temporary bulge classes in other primary schools. The plan under consideration is to accept more children at Boughton Leigh Infant school by making it four form entry instead of having three forms. Brownsover would go from two form entry to one form but children would stay on at the same school until they were 11 years old.